Lack of clarity regarding whether a company is complying with all the applicable compliances as per the nature and size of business. Limitation of Internal Auditors adopting transaction oriented approach, which focusses more on errors or non-compliance in TDS, VAT, Service Tax etc. Internal Tax team is usually busy responding to the urgencies related to Scrutiny Assessment, Return filing, filing of reply to various notices etc. 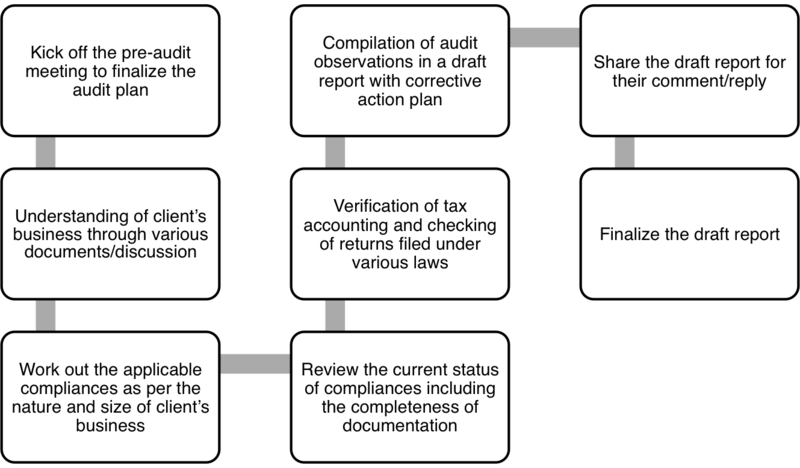 How Compliance Audit can solve these problems? We have a dedicated compliance audit team which comprises of experts in various laws. This team keeps a regular track of ongoing changes in various compliances applicable on different businesses across industries. This team is regularly trained about the approach of carrying out compliance audit. There are many standardized self developed forms and checklists which are used while carrying out audit. Verify the returns filed under applicable Laws and Statutes.